What’s the most important item to take with you on a trip to the library? A simple tote bag. Preferably one made for carrying around books. And why, might you ask is this item on my library list? Well, it’s quite simple . . .
*First and most obvious, it holds your chosen books. *Second, and this is almost a must for parents of youngsters, it can be a storage for your treasured library books. I found when I was a young mother if I kept the books always in each childs tote bag we never lost one. We weren’t on the ever scavenger hunt around the house trying to find each and every library book when it was time to take them back. It’s an easy habit and if taught right off the bat, the kids enjoy it. I simply found a place in their rooms to hang or place their tite bags and everytime they got a book out to read, we simply put in back after the reading. *Third, who doesn’t enjoy filling up a tote bag all for free? 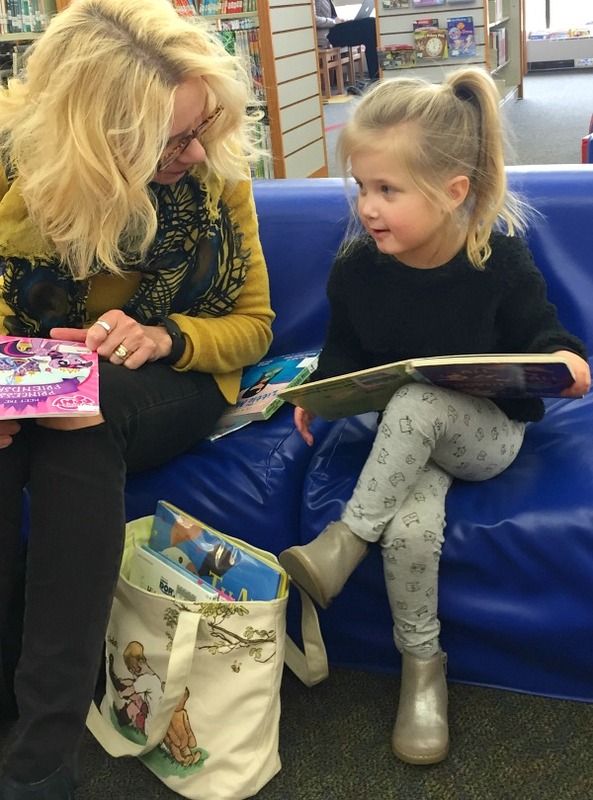 Molly loves going to the library, she enjoys playing with their trains, she enjoys, reading in all their nooks and crannies, but her most enjoyable moments are the ones when she carefully fills her tote bag to the brim and then proudly walks to the car. 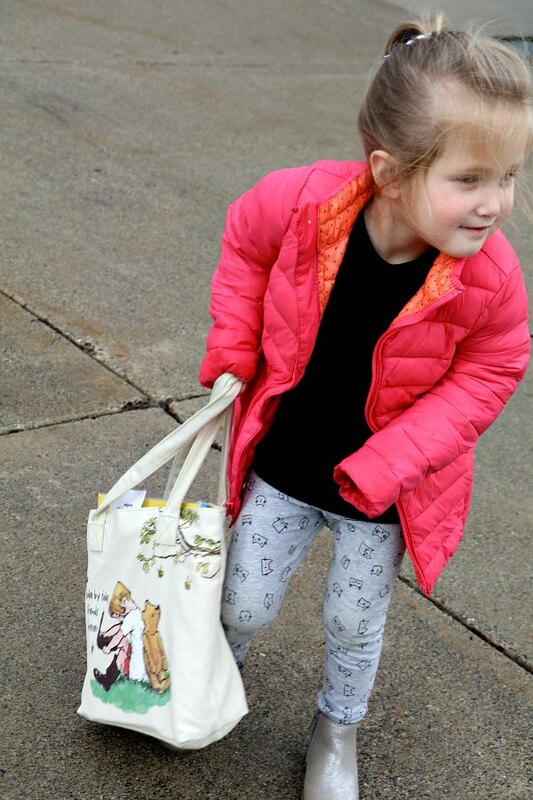 *Some other fun ideas for book tote: you can take them shopping for their own special bag, but you can always buy plain canvas ones at your local craft store for a few dollars and then have a craft day painting and decorating them. Happy Monday my friends! And Happy reading to you. Beautiful pictures of a wonderful grandmother, tender and stylish! Your granddaughter is cute and you are a great person. Being a grandmother has brought out the very best in me. It’s the best blessing ever! Im thinking you’re now a grandfather as well, correct?